A Elorriaga Illera, S Monge Benito (2017): “The professionalization of YouTubers: the case of Verdeliss and the brands”. Revista Latina de Comunicación Social, 73, pp. 37 to 54. Introduction. Thanks to the YouTube platform, people previously unknown can generate such a large community that many brands can be seduced to collaborate with them through a new form of advertisement and product placement. We focus on Verdeliss’ case, a young Spanish mother of six children that has professionalized her activity on YouTube. Methodology. We performed a content analysis of 606 videos published in the Verdeliss’ YouTube channel verifying the presence (spontaneous or sponsored) of brands and their evolution. Results. We established 4 differentiated stages in her contents production, each one with different characteristics. The last stage of their production corresponds to the permanent collaboration with commercial brands. Conclusions. This new profile of professional influencer is obliging brands to re-invent their communication to keep connecting with their consumers. We are attending a revolution in the consumption of audiovisual contents. The incursion of YouTube has promoted the transition of a flow television model, where there is the attempt to catch audience’s attention and mantain it from one program to another, to a model of file television, where there is access to contents on demand (Konpare, 2002). But the phenomenon is not exclusive of YouTube. Cable television, contents services through streaming such as Netflix or the pay-per-view versions of conventional televisions are examples of file television close to us. Concurrently to these changes, new types of contents or new forms to publish them have emerged, like Netflix’s decision to release all the chapters of series they produce simultaneously. We can consider that the mediatic environment is submitted to a very strong evolutive pressure right now (Scholari, 2012; Scholari, 2013), and that probably this relatively new concept of file television will force changes on conventional media. In YouTube’s case, there have appeared content creators adapted to their particular characteristics: the so-called youtubers. These new communicators come from different professional backgrounds (or not so professional though), they produce audiovisual contents with a certain regularity and organize within their own celebrity system, which reflects values that often do not coincide with mass media (Burguess, Green, 2009: pos. 506). There is still few academic research about it because they are a relatively new phenomenon but YouTubers are an extremely interesting case of study due to reach some of them have achieved, such as the Swede YouTuber PewDiePie  which, with a community of almost 60 million followers around the world, with an income of more than 12 million dollars a year. On the other side, it is not only about reach, but also about YouTubers phenomenon as opinion leaders and, therefore, their relevance as prescriptors (Ramos-Serrano, Herrero-Diz, 2016). The sizes of these audiences start to compete with those of the producers of conventional contents such as televisions. Therefore, it is not strange that brands, besides creating their own contents for YouTube (Costa-Sánchez, 2017), they have started to get interested about these new celebrities and influencers of the platform. We must consider that YouTube does not allow monthly subscriptions to contents (like Twitch, for instance) or micropayments to access them (like Filmin), hence the only available business model for YouTubers is the one depending on advertisement (Izquierdo-Castillo, 2012). Therefore, brands can make the most of the attention these communicators generate in two ways. On one hand, they can use the YouTube platform, to hire advertisement that is shown in the same manner as in any other channel, which amount compensates Google (owner of YouTube) and the contents creator. Probably all YouTubers on Table 1 receive enough income per advertisement to dedicate to contents creation professionally. And not only that, but also platforms like YouTube encourage these type of content creators to use their platform to generate a participative culture as well, where they can develop, interact and why not? To learn from one another (Chau, 2010). On the other hand, brands also can sign private agreements with YouTubers to stablish collaborations (Grzesiak, 2017). Thus, for instance, “El Rubius” (from the elrubiusOMG channel) played a leading role in a Fanta commercial on Summer 2017, which was not exempt of critics from some of his fans. But, of course, what turned out to be more appealing for brands is to filter among the contents of the YouTuber’s channel. In this sense, this same YouTuber has filmed and released videos for brands such as Domino’s Pizza  in his channel, as well as Oscar Mayer , Kit Kat  or Kellogg’s . All those trying to keep the humoristic tone of the rest of his contents. The issue about what impact said collaborations have in the YouTuber’s credibility is still very new but has already been examined by some incipient academic researches (Fred, 2015; Keightley, 2015), that suggest there might be a devaluation of the perceived reliability, especially if there is a bad alignment between sponsoring brands and the YouTuber’s own personal brand. However, there are already experiences of fashion and beauty communities where these interactions between brands, contents creators and audiences work thanks to a participative culture and transparency (Chang, 2015; Ko, Wu, 2017). “Consumers do not listen to brands, but they do listen to each other and 90% of consumers trust recommendations from other consumers” (Díaz, 2017). According to Nielsen only 33% trust advertisement, 84% make decisions based on the opinion of others and 74% trust social networks to get informed about products. On a monthly basis, a person can see more than 1.700 banners (CommScore) therefore the traditional digital advertisement model is no longer effective (Díaz, 2017). Brands aware of this reality have started to change the strategies to get to their consumers, targeting their marketing actions towards those individuals that have the power to influence on their consumers’ opinions instead: the so-called influencers. The influencer phenomenon in an intermediate link between brands and consumers that is drawing the interest of marketing responsibles. In fact, 84% of communication and marketing professionals have already developed influencers’ strategies (Díaz, 2017). There are different types of influencers, and to classify them we need to observe the size of their community (followers) and their power of influence. Luis Diaz (2017) differentiates three types of influencers: celebrity influencer, social media influencer and microinfluencer. Celebrity influencers are actors, sportsmen, singers, that is, famous characters that have jumped to social networks and have very large communities of followers. Their prescription power is low. The social media influencer is a person who was previously anonymous that is known as expert in some topic. Finally, the microinfluencer is similar to the previous category but with a community of followers that is smaller, on which there is a greater influence. Brands are aware that celebrity influencers allow them to approach larger audiences, but social media influencers and microinfluencers have more capacity to change attitudes and opinions and, besides, they do it at a lower cost, therefore they rely on them for their strategies. Within this context, the reasons why Verdeliss is chosen for this research are the following. First, even though it can be confirmed that most followed YouTubers are mainly men and talk about subjects mostly linked to videogames, the case of Verdeliss is much more attractive for many brands. While the audience of the former tends to be younger and often minors, Verdeliss’ community includes women of older age who had children or are thinking about having them (Vidooly  categorizes 83.22% of female and 15.26% male audience). It is about a target public with a higher economic capacity and a powerful purchase driver (children). It has been suggested (Lobato, 2016) that a symmetric interest cannot be expected from sponsors and advertisement companies about all topics available on YouTube and that its growth is higher in most attractive segments. Therefore, brands have greater presence in Verdeliss channel than in other digital influencers’ with more followers. And this makes it a more interesting study subject. Secondly, and even though her audience does not reach the top 10, the community that has gathered around her is considerable, keeping in mind that she was an anonymous person before she started releasing contents on the net. We are talking about 1.1 million followers only in her YouTube channel, more than 180.000 on Facebook and more than half million on Instagram. As reference, we can cite other channels of similar topic and that perhaps have been covered on traditional media, such as El Club de las Malas Madres  (2.693 followers) o Miriam Tirado  (9.650 followers). Describe the audiovisual production of the YouTuber Verdeliss. Identify different stages regarding genres used in videos. Analyze the presence of commercial brands in videos. Examine the evolution of said presence through the different stages. This research carries out a semiquantitative content analysis of the audiovisual production of the YouTuber Verdeliss to determine the presence of the brands in their contents through time. A series of quantitative magnitudes of analyzed contents are offered (duration, views, …), as well as a more qualitative analysis of the brands presence and the types of genres used. In essence, it is a case of study that, as we know, focuses in understanding and explaining a concrete and contemporary phenomenon in their real life context (Yin, 2003). In this case, we tried to explain the way brands have integrated into Verdeliss contents and how this evolution towards the professionalization of her activity on YouTube has produced. Considering we are talking about a case study, we do not attempt to look for a statistical representation, but analyze a especially informative example due to the easiness with which brands have integrated in its content. Slice of life: the video shows the family doing quotidian or not so quotidian activities (a trip, an excursion). The characters are the members of her family and talk to the camera naturally (as they would do in the typical family video) but also perform actions belonging to the ongoing activity. This is one of the main genres of the channels and its presence increases progressively in time, as well as the duration of these kind of videos. We could classify it as a sort of reality TV that introduces us in the life of an idyllic family (of eight members in its last stage!) where there never seems to be quarrels or discussions. And, as Khan states (2017), the main driver of users to consume YouTube contents is mere entertainment without complications. Baby’s development: these videos capture some special moment of the development of one of the sons or daughters of Verdeliss (their first steps, their first gurgling, their first words, their first bath …). On many occasions, it is the only content they show, but as Verdeliss channel evolves and videos get longer, this genre is combined with the previous one (“slice of life”). Videocreations: the video combines pictures, video fragments and music in a creative manner. Almost all videos have a cover (some introductory seconds with some overprinted title) that belongs to this genre, but said cover has been omitted unless it is the exclusive content of the video. Camera confessions: Verdeliss (and sometimes her husband, Aritz) talks directly to the camera for some minutes about a topic. The discourse is the main appeal of the video. For instance, she dedicated a series of videos to what she felt every week of her fourth pregnancy and part of the fifth one, but also uses that genre to talk to her subscribers about any other subject she considers (her thoughts about having a fifth child , the presence of brands in her channel  or the bad impression about how things rushed during her fourth birth ). Within this genre there are also a series of short videos (4-5 minutes) where week after week she showed the progress of her belly during the fourth pregnancy and part of the fifth one. Tutorial: Verdeliss explains how to do something, either the recipe of the chocolate cake or to prepare the bag she will take to the hospital for postpartum stay. Product review: A type of video focused on examining the qualities of a product or compares different products/ brands of the same category. It may be spontaneous; like several videos she did comparing different brands of cloth diapers or sponsored (like several product appearances). On the last stage of the production, sometimes it is shown inside another kind of video (usually slice of life). House: A very small portion of videos are dedicated to showing how she has decorated her apartment or to explain different parts of the process of purchasing a piece of land and building a house (that as mentioned in one of the videos, she has paid “thanks to YouTube”). This classification of videos we have prepared specially for the analysis of Verdeliss production is different from the six genres practices by Spanish YouTubers followed the most (Scholari, Fraticelli, 2017): gameplay, interview, television genre, videoclip, tutorial and vlog. Verdeliss never performs “gameplays”, a genre that consists in overlapping the YouTuber’s discourse to videogame screencasts. She doesn’t perform “interviews” either, because the main characters of her channel are her family members and this genre wouldn’t have much sense, nor produces videos imitating “television genres”. Although she did some videocreations that mix music, pictures and video (mainly at the start of her production), we cannot consider that she uses the “videoclip” genre in a similar manner as Zarcortgame or other YouTubers do. Tutorials are present (how to make a chocolate cake, how to prepare the bag you will take to the hospital on the day of birth, etc.) but they are minoritarian in her production (2.8% of the total). Lastly, Verdeliss uses the “Vlog” genre in a prolific manner (which we have called in the previous list as “slice of life”), that is, videos about life experiences where there is no need that they carry out a big trip but they can film a quotidian and family activity. Therefore, the characteristics of Verdeliss productions have led us to use our own classifications of genres instead of this classification published previously. Lastly, to register brands appearance we kept our eyes on the verbal mention of them. In many cases, in the videos where she reflects her life, the brand can be seen in the background, but we have only considered those brands that are verbalized. When considering which of these brands are sponsored, we have assumed what the author herself states in the video description. One of Verdeliss commitments with her followers is to identify what are the brands that pay for appearing on the channel (and besides, almost always these brands receive a link from the video description). We have selected and viewed 606 videos published in Verdeliss YouTube channel. This selection comprises from the first video released in the channel until the last video released on August 13, 2017. The reason of limiting the sample until this specific video is only due to delimiting an object of study that currently is still growing at a pace of a couple of videos per week. The 606 analyzed videos include more than 138 hours of audiovisual contents. Each one of them has an average of 506.099 views (for a total or more than 297 million views) and receives an average of 7.723” likes” (with a total of more than 6.6 million “likes” in total). In 180 of these videos there is some brand (29.65% of the total), either spontaneously or sponsored. As will be seen afterwards, even though brands have always been present in Verdeliss contents, that percentage of videos with presence of brands has increased noticeably in the last stage of its production. Figure 1: Number of views per video in the 4 stages of production. It is worth mentioning that the technical quality of the production is deficient in a good percentage of videos. It is frequent that videos have unfocused fragments or that there is a poor sound quality (sometimes due to the wind’s effect). Framings are scarcely orthodox and heirs of the visual culture of selfie which, on the other hand, it is part of the style of another considerable number of YouTubers, not only Verdeliss’. The appeal of videos does not lie on an elaborated production but in the addictive reality TV instead, that offers a window to the private life of a special family. We have analyzed the evolution of Verdeliss contents and the presence of brands in them, distinguishing 4 differentiated stages, from a first stage where YouTube is little more than a repository of memories or an audiovisual and family “photo album”, until a final stage where brands are present in a sponsored manner in practically one of every two videos. Next, we will analyze said stages in a more detailed manner but on Figure 1 it can be observed how the number of views per video has been increasing over time with some very marked milestones. From this table, we can conclude that videos increase in duration from an average of four and a half minutes on the first stage until the 12-13 of the third and fourth stage. The views also increase as time passes, being the second stage remarkable due to its great standard deviation (more than a million and a half). 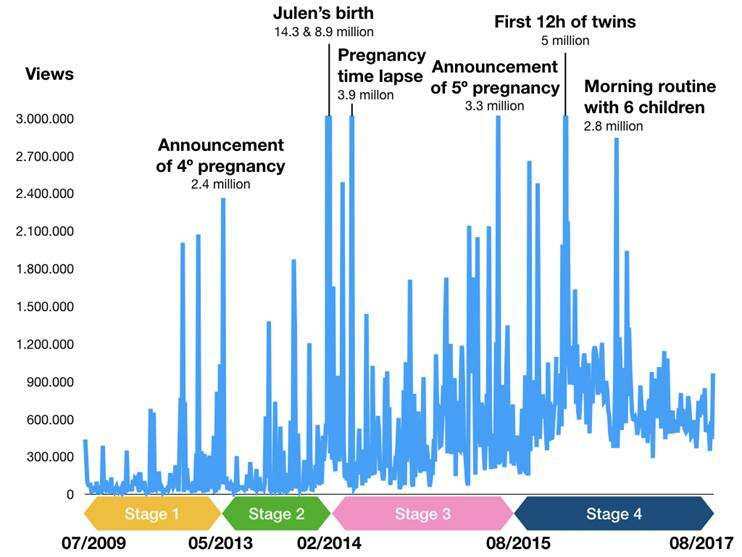 Said deviation is due to the fact that stage 2 includes, as observed on Figure 1, some of the more viewed videos of the whole channel (such as the videos of Julen’s birth, with 14 million and 9 million views respectively). Probably the views of the first two stages are higher than they were when their contents were originally released thanks to the effect of new followers browsing old contents. This phenomenon can be clearly seen in the dates and content of the last comments of videos of the first stages, which usually have comments made on 2017. The number of “likes” also increases progressively as well as the relationship between the number of “likes” and “dislikes” (except the second stage). The evaluation of people that view the videos is relevant because it is one of the indicators the YouTube platform uses to promote contents towards cover (which at the same time increases the number of views). The brands are present in 20-25% of videos of the first 3 stages, but it is a spontaneous presence where the brand has not paid to appear. This percentage boosts to almost half of videos during the fourth stage, where practically 4 out of every 5 videos where brands are mentioned there is some kind of economic agreement or gift of the product. As can be seen, “baby development” is the main genre on the first stage, although due to its exploratory nature, this stage is very heterogeneous. The “camera confessions” play a leading role on the second stage and, from the third, the dominant genre is “slice of life”. The first stage comprises from the first video (28/7/2009) until the announcement of Julen’s pregnancy (26/5/2013). These are almost 4 years of activity (133 videos), although during 2009, 2010 and 2011 very few videos were released (1, 37 and 29, respectively). Viewing all videos of this first stage it is clear that the original objective of the channel was to keep memories of the development of their children and their family life. In general, they are short videos that last 4 or 5 minutes (9 seconds the shortest one and more than 24 minutes the longest one), where one or several members of the family is portrayed carrying out some activity. The dominant genre of this period is “baby development” (46.6%), where they show some milestone in the development of any of their children (first steps, first words, first solid food…) The next genre in frequency is “slice of life” (27.8%) followed by tutorials (10.5%) and videocreations (6.8%). In this stage, the contents creation style of Verdeliss is not very defined yet. One of the genres that seems to be more appealing for their audience (and it is manifested like that by the creator herself) is “a day in our life”, videos of some 20 minutes that summarize a vacation day in the family life (categorized within the genre “slice of life”). Practically, the totality of Verdeliss’ videos are preceded by some sort of cover, a small videocreation that may include music, images and videos together with some text. But for the series of videos “a day in our life”, Verdeliss prepared an especially long cover (1:12) and released it individually . The audience does not have huge leading role yet, although Verdeliss proudly announces on February 2013, that she already has 1.000 subscribers and some statements directly addressed to videos viewers can be found. However, the genre “camera confessions”, which gained so much protagonism during the next stages, is not yet present in her production even though Verdeliss starts talking to the camera on products’ review. The presence of brands (in 18.8% of videos) during this stage of production is spontaneous, unplanned in most occasions. The first mention of a commercial brand in the whole channel occurs in the video of 30/5/2010  when Aritz, Verdeliss husband, states in a video of a trip: “Irati in his Maxicoxi”. The first appearance of Carrefour, a brand that will turn into one of the usual sponsor of the channel afterwards, occurs when Irati (13 months) starts playing with a brochure on the couch and Verdeliss replies “Will you do the grocery shopping in Carrefour?” . These are completely spontaneous appearances where there is no attempt of hiding the brand. This will change on stage 4, where Verdeliss is more about careful about not having brands spontaneously appearing on her videos to favor the attention sponsored advertisers receive. On the other hand, in this stage some product reviews are made (about cloth diapers, specifically). On product review videos  4 or 5 different brands can be mentioned and Verdeliss gives her opinion about them (advantages and disadvantages). One of these videos, surpasses 2 million views and, together with many recipes (roasted chicken, chocolate cake), is one of the more viewed videos on this stage that, in general, does not reach the same follow-up levels of the next three. The second stage comprises from the announcement of Julen’s pregnancy (26/5/2013) to the birth videos (12/2/2014). During this stage, Verdeliss tries to collect the memories of the feelings she have had during Julen’s pregnancy week per week, following the style of the previous stage, but now she is more aware about the presence of the community and addresses it more often in videos. Videos of this stage open and ground the confessional style that will characterize the channel from that moment, with long videos (more than 10 minutes) of the protagonist just talking to the camera. During this period (102 videos, about 9 months), Verdeliss starts being more aware about the increasing community of followers she is gathering in her channel. As has been said before, the dominant genre of this period are camera confessions (74.5%), with a certain presence of “slice of life” (17.6%). During Julen’s pregnancy, Verdeliss releases a video on a weekly basis talking about what her physical feelings have been (or even emotional) during that week of pregnancy and another video monitoring the development of her belly and her weight. Said videos are filmed as a monolog targeted to an audience and in them the first mention to it is done: Greetings and acknowledgement for following and comments. However, there are no other kinds of mentions which are more common among professional YouTubers (McRoberts et al., 2016), such as dedicating attention to specific followers or suggesting to interact with the channel in a specific manner (by clicking “like” or writing a comment). We must consider it is not a coincidence that professional YouTubers tend to do such actions, because YouTube promotes videos to places of more visibility according to some of these metrics (number of views, comments, “likes” ...). There also rises the stage of new genre when the family receives the house they have purchased in Pamplona some time before and Verdeliss performs a series of videos showing how she decorated the rooms of the house (4.9% of the total of videos). The authentic milestones of this stage are the videos of Julen’s birth , which got about 14 and 9 million views respectively. On this stage, Verdeliss typical greeting to the camera consolidates: “Hi YouTube!”. Often YouTubers have their own greetings that collaborate in sustaining their personal brand (Mingione, 2014). Verdeliss tends to open almost all her videos with some kind of videocreation that includes a text. Behind this cover, practically the totality of her videos of confessional genre start with a “Hi YouTube!”. Regarding brands’ presence, these are present in a fourth (26.5%) of videos in a similar manner as the previous stage: either as a spontaneous mention as videos action develops, or as part of a recommendation or direct comparison by Verdeliss. In no case, if we pay attention to the statements of the YouTuber, it is about sponsored presence. The third stage starts after Julen’s birth, with a video of the presentation of the baby’s space at home (13/2/2014), and ends with the announcement of her third live meeting with her followers. They are 183 videos in total. In this stage, the community keeps increasing exponentially and a new characteristic phenomenon appears: the “meetings” with her followers, that is, encounters of the followers with the YouTuber in real life. The first two is held on Summer 2014. The first once was done in El Retiro park on 15/08/2014 and Verdeliss does not record anything because she feels overwhelmed by the event, so she limits herself to thank attendants in a video . The second one is done in a park in Barcelona on 07/09/2014 , and dozens of people attend bringing several gifts for the family. On minute 7:30 of that same video, Verdeliss states that on that moment they became aware of the number of people following and appreciating them. The third meeting occurs in a store in Madrid on Summer of 2015, more specifically on 16/08/2015 , and technically the video about her is framed within the fourth stage, when sponsored brands have already appeared on the channel. Hundreds of people attend to this meeting and lasts more than three hours. The line to wait for the turn to see them extends to sidewalks close by and many people cannot greet them because they cannot stay long. During this stage, Verdeliss keeps making videos more often, at the same time that she increases their duration. The dominant genre of this stage is the “slice of life” (62.1%) and, as Verdeliss confirms that it is the type of video most appealing for her followers, said genre gains more protagonism on the next stage. Also, there are some camera confessions (23.6%) and even videos that mix these two styles (“slice of life” and camera confessions), because their duration increases considerably on this stage (20-minute duration videos are frequent) and this makes they can have more confessional parts and others where the family activity is portrayed. Moreover, there is a certain presence of “Baby’s development” videos (15.4%). As a consequence of the dominance of videos belonging to the genre “slice of life”, the presence of brands in a spontaneous manner still occurs (in 21.3% of videos), but now with more visibility and exposure. This is the stage that probably catches the attention of commercial brands. Verdeliss has turned into a reference in her thematic field (maternity and raising), with hundreds of thousands of followers and a demonstrated capacity of physical convocation. Her recommendations in her experience area probably have a very strong effect on her followers. And this is very attractive for commercial brands that, as we will see, will hasten the change towards phase 4. We have considered that the video “Opinion about advertisement on YouTube + New Project ?? ?”  (13/8/15) starts the fourth stage, that is still ongoing and which we can define as the stage of the presence of sponsored brands (187 videos). As they declare in the same video, up until then they have only collaborated with two brands (Lays and the application Clue) and only in one of the occasions there was a previous economic agreement (Lays). As they say themselves in this video of confessional style, this is an inflection point where they think about collaborating with the brand Carrefour by performing a series of videos of themes related with the contents of their channel (back to school, children’s electronics). Behind Carrefour much more sponsored brands with come (Dry Nites, Mamichic, Kobold, Dodot, Pabloski, Mumablue, Mission Wraps, Global Humanitaria, Little Swimmers, Planeta de Agostini, Bebitus, Coca Cola, Bugaboo, Duracell, Rastreator, HP, Mercadona, Turismo Toledo, Lookiero, Booking, Fontvella, Samsonite...), which presence marks this fourth stage in YouTuber’s contents. As can be observed on table 3, practically half of videos published on this stage (47.6%) refer to brands and 39.5% (83% of videos with brand appearances) are brands that have paid to appear in the channel. The absolutely dominant genre (89.2%) in this stage is “slice of life”. Brands seem to integrate into the quotidian life of the family with gifts or quotidian scenes. There never appear more than one sponsored brands per video and, generally, where there is a sponsored brand it is the only brand with presence on that video. During this stage we start to observe direct efforts from the YouTuber to avoid that brands appear spontaneously on the channel, both verbally and visually. This is a phenomenon that has not produced up until now, since brands were mentioned with complete spontaneity when they were present so far. The analysis of these 606 videos allowed us to identify 4 differentiated stages within the YouTube production of Verdeliss and clearly describe the evolution of the presence of brands through them, as was our objective. We have observed the progression from a shy approach to the media as if it were a kind of family memories album (stage 1) until the consolidation of a reality TV genre we have called “slice of life”, in which commercial brands pay to be part of (stage 4). All these, have happened while undergoing a phase where Verdeliss discovers the confessional genre and starts to feel comfortable talking to the camera for her audience (stage 2) and another stage where there is the growth of the community that includes presential meetings (stage 3). The last stage (stage 4) is a clear example that the influencers marketing is present in our YouTube nowadays, and according to a study (Díaz, 2017), 84% of communication and marketing professionals have already developed strategies regarding Internet influencers (among these, YouTubers). As has been previously been indicated, there are many brands that look for presence in the Verdeliss channel through a sponsored presence. In this last stage, the presence of sponsored brands practically duplicates compared to previous stages, at the same time that spontaneous presence reduces. We cannot ensure it is related, but we can observe the first signs of weariness, such as some negative comments, videos with more “dislikes” than usual or negative reactions to statements such as that YouTube has paid the chalet they are building for themselves in Pamplona while we write these lines. However, in general terms the Verdeliss channel still has a good health, with more than one million subscribers and between 300.000 and 900.000 views per video. Verdeliss has found a genre of herself where brands feel comfortable meddling. The thematic approach (children and raising them) is one of the key issues of its appealing for brands and it is very likely that Verdeliss receives more advertisement income through direct commercial agreements with brands than other YouTubers with a greater number of subscribers. The anonymous amateurs that professionalize their activity on the platform (such as Verdeliss’ case) are a very interesting case of study from the perspective of their professional profile. We can conclude that, at least in this case, the technical expertise and professional skills related to audiovisual creation or digital marketing have not played a role in her success, above all if we judge by the number of views with a questionable framing, unfocused or with deficient sound that can be found in the YouTuber channel. Nevertheless, several higher education centers have rushed to offer specific information about influencers marketing. One of them is Fundación UNED, which for a price of 400 Euros offers an online course of 60 teaching hours “thought to help develop a successful online strategy, analyzing the success factors of network communications and how to generate contents that can be attractive for our target” . We could question whether these kinds of courses have sense considering cases such as these, where the production quality is utterly absent and its main appeal is that addictive reality TV offered to its followers. Does this new professional profile need an education for practice? And if so, does he or she need to dedicate an important part of the teaching subjects to technical skills (video editing, tool management, digital marketing)? In short, “Can you study to be a YouTuber? And is the YouTuber born or made?”. What seems clear is that the market will demand professionals that know how to identify these influencers with interesting communities for brands and to manage marketing strategies with them. In this case, the keys for success will probably be related to the qualification of audiences, transparency and integration of brand messages in the contents creation style of each influencer. And we must acknowledge that, in this sense, brands have integrated wonderfully in the creation style of this YouTuber. The authors of this paper have received funds from Universidad del País Vasco/Euskal Herriko Univertsitatea for elaboration. Angeriñe Elorriaga through the grant for Reincorporation to Research Activity PPGI17/15 in the cínsolidated research group Bitartez (IT1081-16) and Sergio Monge Benito through his participation in the consolidated group Mediaiker (GIU 16/08). Chau, C. (2010). YouTube as a participatory culture. New Directions for Youth Development. Volume 2010, Issue 128, 65–74. Costa-Sánchez, C. (2017). Estrategias de videomarketing online. Tipología por sectores de negocio. Communication & Society 30(1), 17-38. Kompare D (2002). Flow to files: Conceiving 21st century media. In: Media in Transition 2 Conference, Cambridge, MA, 11 May 2002. Available at: http://cmsw.mit.edu/mit2/Abstracts/DerekKompare.pdf [Consultado 10/10/2017). Carlos A Scolari, CA; Fraticelli, D (2017). The case of the top Spanish YouTubers: Emerging media subjects and discourse practices in the new media ecology. Convergence: The International Journal of Research into New Media Technologies, 1–20. Burgess J and Green J (2009) YouTube: Online Video and Participatory Culture. Cambridge, MA: PolitePress (Kindle edition). Grzesiak, M (2017). How a Personal Brand that has been Creatively Established in Social Media Becomes a Passport to Traditional Media and Receiving Advertising Contracts. Proceedings of the 3rd World Congress on Electrical Engineering and Computer Systems and Science (EECSS'17). DOI: 10.11159/snsm17.107. análisis de 3 modelos de negocio. El profesional de la información, v. 21, n. 4. ISSN: 1386-6710. Khan M. (2017). Social media engagement: What motivates user participation and consumption on YouTube? Computers in Human Behavior, vol. 66, 236. Lobato, R (2016). The cultural logic of digital intermediaries: YouTube multichannel networks. Convergence: The International Journal of Research into New Media Technologies, Vol. 22(4), 348–360. McRoberts, S; Bonsignore, E; Peyton, T; Yarosh, S (2016). “Do It for the Viewers!” Audience Engagement Behaviors of Young YouTubers. Proceedings of the The 15th International Conference on Interaction Design and Children, 334-343. DOI: http://dx.doi.org/10.1145/2930674.2930676. Mingione, D (2014). Hello Internet! An Analysis of YouTuber Greetings. Explorations in Linguistics, Volume 1, Issue 1, 2014. Neuendorf, K A (2017). The Content Analysis Guidebook, Second Edition. Sage, Los Angeles. Ramos-Serrano, M; Herrero-Diz, P (2016). Unboxing and brands: youtubers phenomenon through the case study of evantubehd. Revista Prisma Social, Especial 90-120. Scolari, CA (2013). Media evolution: Emergence, dominance, survival, and extinction in the media ecology. International Journal of Communication, 7: 1418–1441. Yin, RK (2003). Case study research. Design and Methods. Thousand Oaks, California: Sage. Renó, Denis, (2007): "YouTube, el mediador de la cultura popular en el ciberespacio", en Revista Latina de Comunicación Social, 62, páginas - pages 190 a 196. Gallardo-Camacho, J. y Jorge Alonso, A. (2010): "La baja interacción del espectador de vídeos en Internet: caso YouTube España", en Revista Latina de Comunicación Social, 65., páginas 421 a 435. I Arroyo, M Baños, C Van-Wyck (2013): “Analysis of the campaign videos posted by the Third Sector on YouTube”, at Revista Latina de Comunicación Social, 68, pages 328 to 354. Article received on 19 November 2015. Accepted on 11 January.